This blackberry wine recipe produces a dry wine, similar to a “Beaujolais” wine. It’s easy to make from free hedgerow ingredients or a glut of cultivated blackberries. A true country wine that goes particularly well with a mild soft cheese. Cultivated blackberries tend to be more productive with larger fruits than their wild cousins and fine flavour. 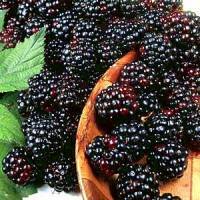 There is information on how to grow blackberries on the Allotment Garden website. Strip the blackberries from the stalks and wash well. If you place the berries in a bowl of cold water, any insects or maggots hiding will float out. Chop the sultanas and add to the bin. Cover again and leave for 3 or 4 days. Fermentation should have slowed a little by now. Pour carefully into a gallon jar, leaving as much sediment behind as possible. Makes 1 gallon of Beaujolais style wine. Usually it’s quite drinkable as a young wine after a few months and exceptional after a year stored in your cellar. Sometimes the yeast takes a few days to really get going and sometimes it just doesn’t. I’d suspect the yeast is to blame. Try mixing some more yeast in a cupful of warm (about room temperature) water with a teaspoon of sugar. Once that starts to ferment add to the demijohn and it should start going like billyoh. Sorry, I’m stumped. Doesn’t make a lot of sense. There must be a reason, but I don’t know what it is. Did you wait 12 hours to add the pectic enzyme after combining the berries, water,sugar & campden tablets and an additional 12 hours to add the water & sugar fed yeast? Campden can kill the yeast if it’s added before a full 24 hours from your starting time (this includes the 12 hour you wait to add the pectic enzyme)? Also you want to make sure to stir the mixture vigoursly twice a day with a sanitized utensil. I prefer a slotted paddle available at any wine/beer making store, which I simply pour boiled water over it and let it cool a bit before using. Your temperature could be too low as well. That would be my first guess at why fermentation isn’t happening. Check online for the optimum temp, and cover it with a towel or blanket to keep it at a steady cozy warm temp. Check the temp. If it’s below approximately 75 farenheit, the yeast go to sleep. It’s an easy fix if that’s the case. Also, add yeast nutrient when you pitch your yeast or if it slows down before you think primary fermentation is done. Feel free to comment back if you have more questions. I noticed you didn’t mention using nutrient or yeast energizer so that with a good steady warm temp should do it. Best of luck and don’t give up!